In the fall of 2015 my sister, who lives down in Terrebonne Oregon, asked how I felt about trying my hand at building a tiny house. It is something I had been talking about doing for a while, but never had the space or funding to undertake. Enter this opportunity. They had a building near their house that was gutted and need of a lot of work, but was a solid structure with sheathing, a roof, and some electrical and plumbing already ran. I had been thinking of jumping the Portland ship for a while, here was my opportunity. After a couple of work trips down here, I finally made the jump sometime in November. This was it, after about 11 years of living in the Portland area; I was finally leaving the place I considered home. To me this was escaping gravity, escaping the pull of a place I had grown to love and all the friends I had made there. I would be moving to a place where I knew no one – other than my sister, brother in law, and my oh so awesome niece (she is reading this over my shoulder). It was getting down to -5 degrees at night when I moved here. I had never experienced anything like that in my life. Come to find out, not all that bad. The construction came along over the course of the following couple months, and finally sometime in January I moved into the mostly completed structure. Finally, I had my own small gear wall! 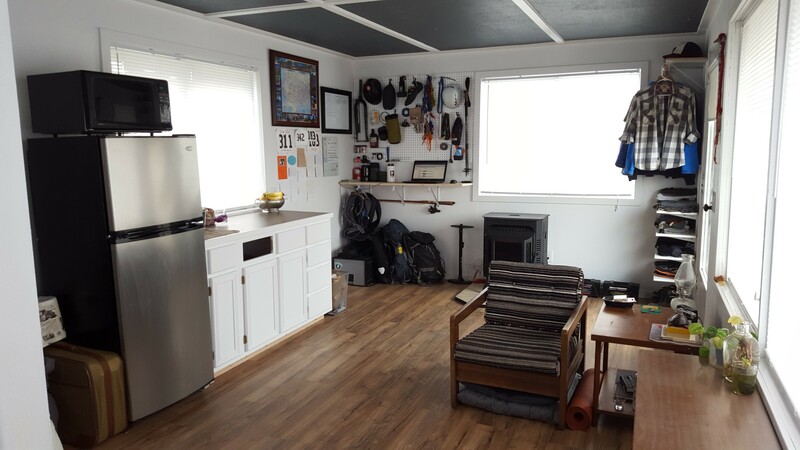 It has almost been a year since I moved into this 240 square foot tiny house. It has been a great base camp for my adventures in this beautiful and sunny area of Oregon. As I start to purge belongings and get ready for the next van chapter, it is all starting to sink in that I am really doing this again; not just moving, but moving back into a Vanagon. Honestly, I will miss the time I get to spend with my family, but also really excited for this next adventure. It has been so enjoyable having you live so close by. I got to know you on a much deeper level and your niece as awesome as she is…will be less awesome because you are no longer apart of her everyday life. I understand your need for adventure, but I wouldn’t be a good sister if I didn’t try the guilt trip approach first. This has been a great experience, and definitely got to know you all better that would have ever been possible without living next door. As with each place I live, come to love, then leave, it will be hard to move on to the next place. Thank you for talking me into leaving Portland and coming down here.